In today’s world, the average person has the ability to travel across the world, and build an understanding of mankind’s past all over the world. In recent history across Europe, the Nazi German regime that conquered much of Europe, was also set on wiping out the European Jewish population. All across Europe, there are remnants and memorial that were constructed in order to preserve the memory of the atrocities that took place across Europe at the hands of the Nazis. 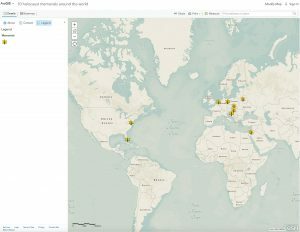 I wanted to create a map that would display some of the most important holocaust memorials and museums that continue to serve as to the 12 million people who lost their lives at the hands of the Nazi’s holocaust. This map is publicly assessable to anyone that has access to the internet and has an interest in visiting, or at least wants to gain an appreciation for the atrocities committed across Europe. More particularly, this map was created for the purpose of encouraging tourism to these memorials and museums with the purpose of spreading awareness of the holocaust. Since this map exists on the internet, there is no physical place that it definitely belongs and no person exists to transform this map into an actual memorial for people to come and observe. Instead, it hopes to serve the purpose of encoring the average person to visit holocaust memorials across the world and build an understanding for the holocaust outside of the classroom. When putting my map together, I decided to focus my attention towards the atrocities committed against European Jews, excluding the other six million souls that lost their lives during those turbulent times. Though, the memory of those non-Jews is no less significant than the loss of the Jewish populations, Jews were the main target of persecution and violence in Nazi Germany before Hitler’s Final Solution was ever conceived. This map hopes to encourage the feeling of cooperation and peace across cultural and religious lines instead of separating people and encouraging violence as they have done throughout the vast majority of history. The implicit design of this map does not encourage much in terms of inspiring humans to live cooperatively with one another. 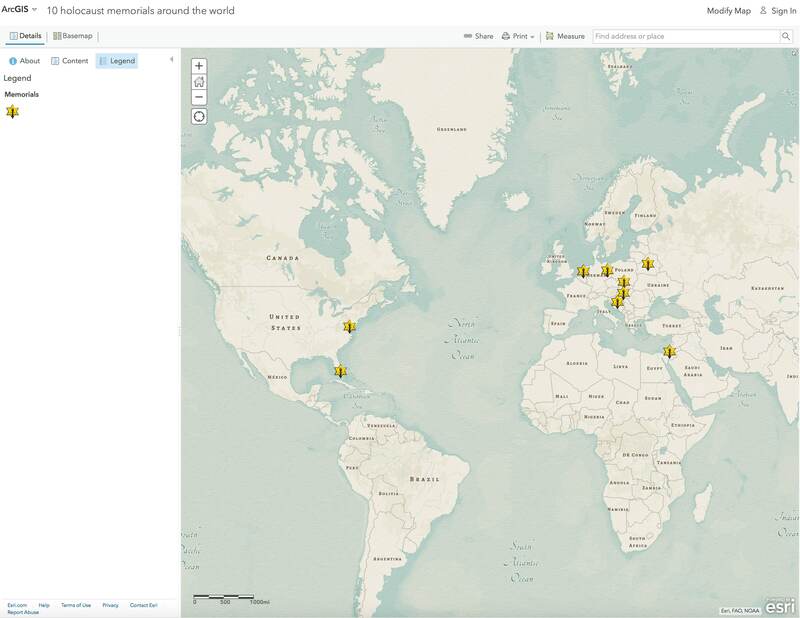 In providing easily accessible information on many of the monuments of the holocaust around the world, this map hopes to deliver the necessary information needed to encourage the average person to go and visit these museums and monuments. By placing the information of these sites on a map, the average person will be able to see what options are close by, and are most easily accessible depending on their given location on the Earth. Intended for almost anyone that has access to the internet, I hope to be able to encourage more people across the planet to build their own connections and understandings to the horrors of the holocaust. Accessible to anyone, this map hopes to encourage everyone to take up the torch of ensuring that acts of systematic murder are never again carried out anywhere in the world. The most important part of this map is the fact that everyone has access to it. While it may not spur its viewers to take action against hate and bigotry, this map inspires people to go and educate themselves on what happened in Nazi Germany that led to the mass extermination of Jews and other “undesirables” across Europe. In encouraging people to educate themselves on the true horrors of the holocaust is one of the most important steps in taking action against letting something similar to ever occur again. Especially with the rise in anti-Semitism taking hold in parts of western society, it is more important today than ever to encourage people to understand the true struggle Jews and other cultural groups faced at the hands of bigotry. My name is Andrew Yaunches. I am an American Jew who is studying history. 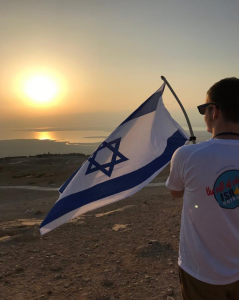 I am deeply connected to my heritage and I seek to understand and uncover the truths of the darkest days in not only Jewish history, but the history of us as humanity as a whole. What I like best about this is its accessibility to everyone. People can learn about the memorials even if they don’t have the money to travel to see them all.